The State Administration of Press, Publication, Radio, Film and Television for China has today officially broadcasted Boonie Bear film in Kenya paving the way for Pay Television Company StarTimes Media to broadcast the content on their terrestrial and satellite platforms. Boonie Bear is a Chinese animated 3D film which is the most popular children’s show with more than 400 episodes having been produced so far. Its premiere in Kenya marks the first time that the film is broadcasted in Africa presenting family based broadcast content for the young generation with unique combination of educative and entertaining content which will go a long way towards cultivating Chinese and Kenyan culture. Speaking during the broadcast ceremony, Information Secretary in the state department of broadcasting and telecommunications in the ministry of ICT Ms. Judy Munyinyi noted that the inter-cultural relations between Chinese people and Kenyans have consistently grown which has led to Chinese TV films, dramas and movies gaining popularity hence becoming a significant cultural force in building relations between the two countries. “China remains the country’s strategic partner and enhancing our cultural relations through broadcast content presents a unique platform to reach out to the majority of households thereby enabling our people to understand each other better for mutual economic and social benefits,” noted Ms. Munyinyi. The Director General, International Cooperation Department in the State Administration of Press, Publication, Radio, Film and Television Ms. Ma Li, noted that television continues to be a strong medium through which information is pushed across diverse audiences. “The broadcast of Boonie Bear in Kenya is significant in that the target audience is the young generation who once they are able to appreciate the value of our cultures will cement the inter-cultural relations between our Kenyan friends and Chinese people,” noted Ms. Ma Li. “At StarTimes, we are glad to have a platform that not only presents entertainment value but also informative content that facilitates better understanding between people from different nationalities. The broadcast of Boonie Bear presents a new milestone in promoting inter-cultural relations between Kenya and China”, noted Ms. Guo Ziqi, StarTimes Vice President. 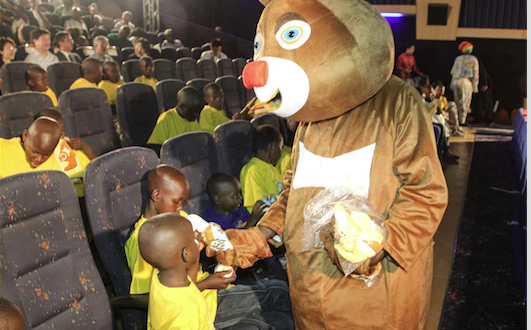 The broadcast of Boonie Bear is a follow up to a similar engagement by the Beijing Municipal Bureau of Press, Publication, Radio, Film and Television where the team launched the Beijing TV Dramas & Movies Broadcasting Exhibition in 2015 that featured the showcase of Chinese dramas and movies in Africa.